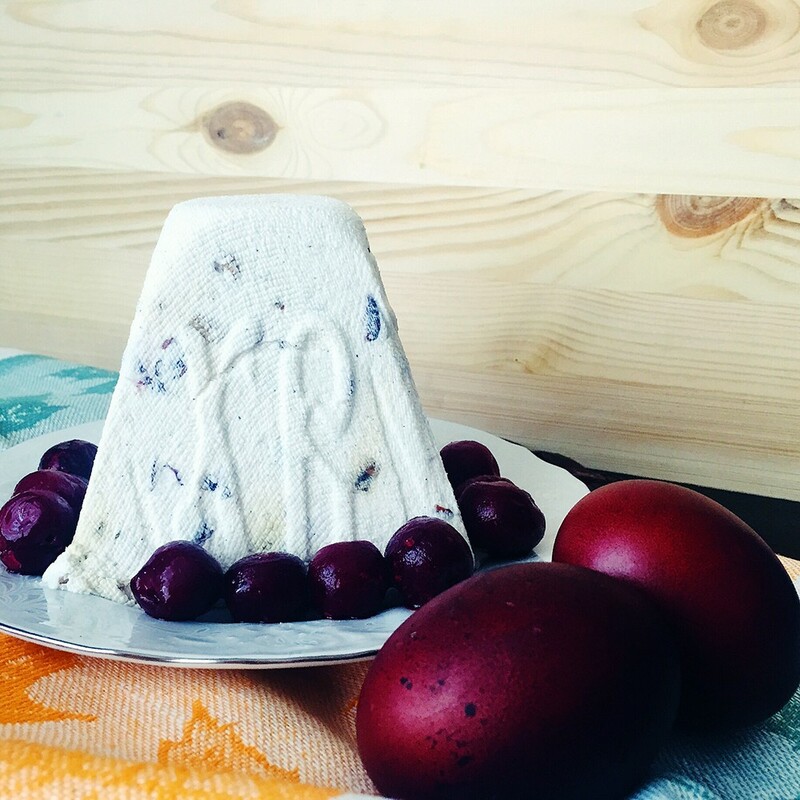 Today I want to share with you an unusual recipe for cheese Easter. Why unusual? Just because he is not quite the traditional (as opposed to Easter recipeI led last year), but no less delicious! Prepare home Easter is very simple, and treat it turns incredibly air (not heavy and greasy! ), Moderately sweet. Like a souffle, it just melts in your mouth! Of course, there are a few secrets - I will share them. Also drew attention, in this recipe, I do not use butter, not to "make heavier" dessert. Instead, I take a milk chocolate - such a combination, in my opinion, makes the consistency and taste perfect. Yes, a little trick and tip: you can use as white chocolate (if the color that does not affect the finished dessert, and probably not all will be able to "solve" the cause of the unusual flavors) and conventional milk or even dark (from 57% cocoa or higher - at your discretion). I used white so as not to focus on the chocolate component, as well as to preserve the natural color. If you still do not know what to prepare for Easter and what it is to give preference to the recipe (after literally hundreds of them! ), Make Easter curd soufflé with chocolate. Such a treat in a new reading will not leave anyone indifferent! *Use an ordinary cheese of briquettes (not soft and creamy! ), Fat content - at your discretion. The main condition: the product must be fresh, not sour, and other flavors. First of all, the curd must be rubbed through a sieve and whisk blender (Until a smooth consistency). This is required, do not neglect them, or Easter will be like a dessert or cheese mass, and not on the tender souffle. Chocolate (chocolate with use good quality composition) to break into pieces and melted in a microwave oven or a water bath. Connect the molten mass with cheese and then "punch" blender. Beat eggs until fluffy (if using extra sugar, then add it to the eggs at this stage), then add the cream, whisking for about a minute. When put on a low heat and cook, stirring, until thickened about 5 minutes. Remove from heat and cool. [Because eggs "welded", they should not be afraid: the mass prokipela and possible micro-organisms and bacteria are destroyed]! The egg mass add to the brew cheese, again mix thoroughly using a blender. Add vanilla, candied fruit / dried fruit and mix until uniform. Form for Easter vystelit gauze (for want - use a suitable sieve size) and put it in her cottage cheese. Cover the edges of the cheesecloth and press down oppression. Pasochnitsu Put in a bowl or plate and send in the refrigerator overnight. Before serving, carefully turn the form and remove the gauze. And let your Easter morning will be the most delicious! Bright your holiday! Still do not know what to prepare for Easter? - Other simple Easter recipes you will find here.